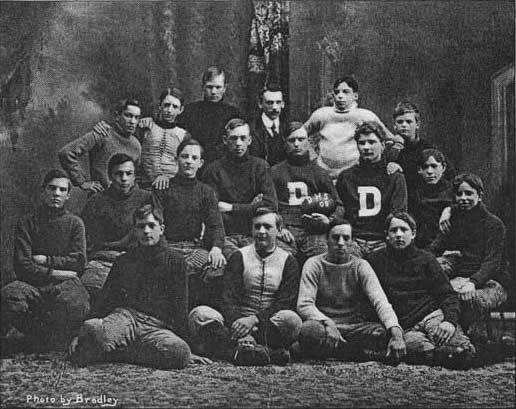 The 1905 Derby High School team was the first to beat Shelton - and they may have done it twice in the same year, but neither game was on Thanksgiving! Watch for an update on the 1905 game next week. How old is the Derby/Shelton football rivalry? As you can see from the press release below, one opinion says that this year's game will be #100 in the rivalry. We'll leave that up to others to decide, but to help with the debate, you can check out some history here. Whether this game is actually #98, 99, 100, 101 or 102, it is truly a special one, and the festivities surrounding it will be extra special this year as you can see below. The festivities will kick off on Tuesday, November 23 when the Derby/Shelton Rotary Club hosts its annual luncheon for senior members of both teams, the cheerleaders, coaches, administrators and mayors. Each school also brings back a former player to tell the story of their involvement with the game and their lives since graduating. Click here to learn more. The Club will also be introducing a new Rotary Club trophy that goes to the winning team to keep for the next year. Once a team accumulates 10 wins, they get to keep the trophy permanently as Shelton did with their win last year. Click here to participate in our poll on who will win this year's game. Click here for a great article in the Huntington Herald about the game. And just in time for the half time show, Shelton has revived the PomPon squad! This year, will mark the 100th playing of the football rivalry between Shelton and Derby High Schools. To mark this momentous occasion, there will be several activities taking place in addition to the contest itself. Football player alumni will be recognized from both schools at halftime of the game. There will be an alumni reception tent in the stadium where former players can congregate and socialize during the game. The initial coin toss will take place at mid-field with dignitaries from both cities including the Mayors, School Superintendents, School Board Chairs, School Principals, and special for this year; former football players, Jim Braccnaro – Shelton ’40 & Frank Saldemarco – Derby ’39, will be on hand to start the game. Commemorative pins, t-shirts, and seat cushions will be sold as mementos to the history of the rivalry. Both varsity teams enter the game with a 2010 season record of 5-4. The overall rivalry stands at Shelton- 49 wins, Derby- 43 wins & ties- 7. The first game was played in 1904. It remains one of the oldest continuing high school football rivalries in the nation. Tickets for the game will be on sale at both schools beginning Monday 11/22/10. For more information please contact Shelton Athletic Director, John Niski or Derby Athletic Director, Joseph Orazietti.